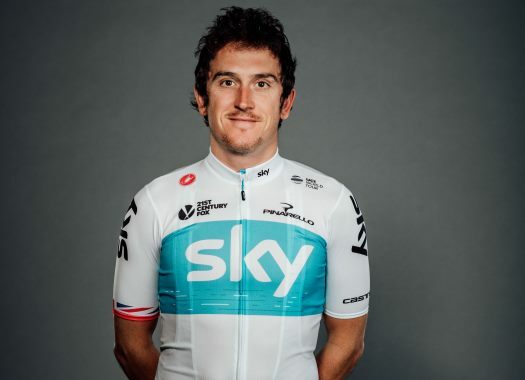 Geraint Thomas (Sky) has won the 11th stage of the Tour de France. The rider attacked at the last climb and overtook Mikel Nieve at the last metres of the mountain finish. The second stage at the Alps was 108.5 kilometres long between Albertville and La Rosiere Espace San Bernardo with a profile that included two hors-category climbs, one of the second category and a finish on a first category ascent. Peter Sagan (Bora-hansgrohe), Dani Navarro (Cofidis), Damiano Caruso (BMC), Romain Sicard (Direct Energie) and Warren Barguil (Fortuneo Samsic) were the first riders to escape on the day. Soon the World Champion couldn't hold the pace and new riders joined the front including the Polka Dot Jersey wearer Julian Alaphilippe (Quick-Step Floors). On the descent of the first climb of the day, Alaphilippe, Barguil and Thomas De Gendt (Lotto-Soudal) took the lead but waited for the rest of the escape before facing the ascent to the Col du Pre. With 54 kilometres to go, Alejandro Valverde attacked and some kilometres later joined his teammate Marc Soler who was previously part of the breakaway. Meanwhile, Alaphilippe dropped from the front group and Barguil took the next KOM points. At the descent of the Cormet de Roselend, Soren Kragh Andersen and Tom Dumoulin (Sunweb) attacked and created a gap with the rest of the peloton. Just arriving at the bottom of the descent, the two Sunweb riders got to Valverde and Soler as the latter finished his work for the day. Caruso, Barguil, Mikel Nieve (Mitchelton-Scott), Michael Valgren (Astana) and Amaël Moinard (Fortuneo-Samsic) started the last climb together. Moinard was the first one to drop from the front group, while at the back Dumoulin and Valverde were left by themselves by their teammates. With nine kilometres to go, Nieve attacked from the front and went on by himself. Behind, Valverde couldn't hold Dumoulin's wheel and was also dropped to be caught by the favourites' group. As the climb continued, the pace of Sky's train left riders like Ilnur Zakarin (Katusha-Alpecin), Jakob Fuglsang (Astana) and Valverde behind. With five kilometres to go, Geraint Thomas (Sky) launched an attack just as Michal Kwiatkowski turn to pull was over. The next to attack was Romain Bardet (AG2R La Mondiale) in a strong attack that was followed by one of Chris Froome (Sky). Nairo Quintana (Movistar), Primoz Roglic (LottoNL-Jumbo), Dan Martin (UAE Team Emirates) and Vincenzo Nibali (Bahrain-Merida) stayed in the group with Froome while Thomas arrived to Dumoulin's group, who was by then with Caruso. With 3.8 kilometres to go, Martin attacked and Froome stayed at his wheel while the others remained behind. A kilometre later, Steven Kruijswijk (LottoNL-Jumbo) joined the Bardet group but they were uncapable of getting to Froome. In the last kilometre, Froome left Martin behind and just as he was arriving to Dumoulin's group, Thomas attacked, overtook Nieve and went on to take the stage victory. Dumoulin and Froome took the second and third position of the day. The Bardet group lost 59 seconds. Thomas takes the Yellow Jersey, with Froome and Dumoulin moving into second and third place respectively.